They are abundant and they are everywhere. Most of birders really don't care much about this little bird. Even photographers will be reluctantly zooming in their camera towards Carolina Chickadee (Regulus satrapa). But have you ever wondered for a second why there are so many of them? John James Audubon named this bird when he was in South Carolina. In fact, these intelligent, curious birds carry a very important message: "follow us, we know where food is! A lot of passing through, or migrating song birds mixing with chickadees forage at stop-over grounds. I spotted one Tennessee Warbler and my first Ruby-crowned Kinglet by just watching these vivacious birds! If you are wondering where everyone's gone ...I mean where birds are, follow Carolina Chickadee's move (hear their songs and calls here). So pay attention to these chickadees during migration time, you may gain few more life birds! Happy Birding! -- Linda. 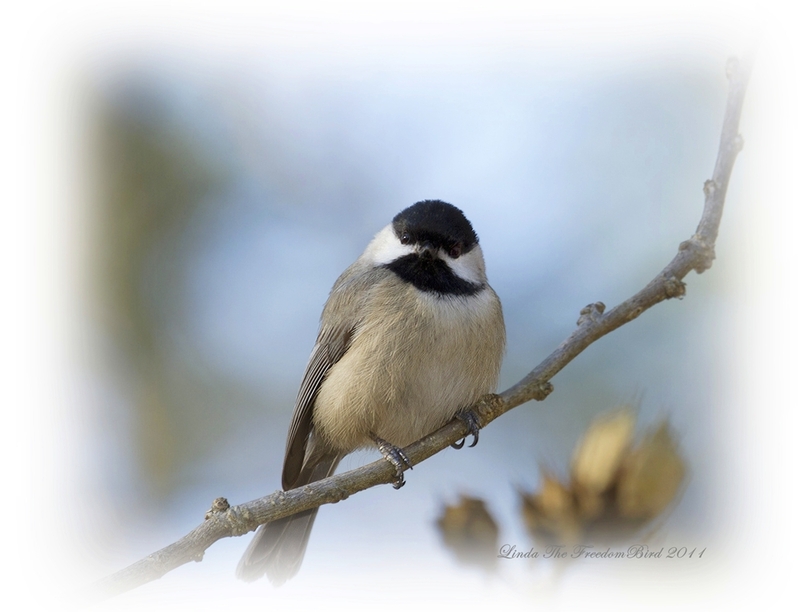 See other post of Carolina Chickadee here. Im going to love tis shot .A dreamy look,cute looking n no oversharpen Tis is just wut i wun. But u need to take care of your composition .The top part need to crop more.Anyway bravo!!!! Super tweety with life jacket is singing now! Thanks Super Tweety for your support and comment! I learned doing artistic way from my master sifu. Sifu is a real Pro! I disappointed my sifu by not listening to what sifu taught me earlier. Im glad you enjoy this image. Anyway, hawk is coming after this chickadee! Stay tuned! Oh, I just love his little face! Thanks Mimi for your kind comment :) I am glad you like this tiny guy! I will be on the road first thing in the morning and will get in touch with everyone as soon as I arrive my CBC location. Have a good evening!